Grappling vs Striking – You decide where to start! Today this is the most prominent question asked by beginner-martial artists. Thanks to the rise of Brazilian Jiujutsu (BJJ) and the success of wrestlers in the UFC it is pretty obvious that grappling has great benefits. So why don’t we just go for grappling then? 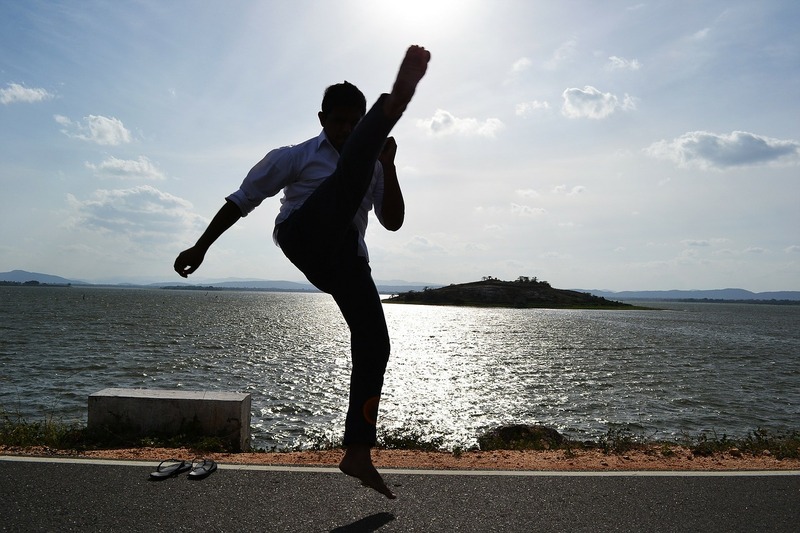 Why do many aspiring martial artists question whether to start with a striking martial art like karate, boxing or muay thai or a grappling martial art like wrestling, judo or BJJ? The answer is quite simple actually. For generations, we have watched movies that romanticized striking martial arts. If I were to speak of myself, I would say that I have watched dozens of Kung Fu movies with my favorite one being “Snake in The Monkey Shadow”. How about the original “Karate Kid”, “Blood Sport”, “Rocky 1” all the way to “Rocky 245,568”? In the 90’s the Gracies started turning the tables and today the UFC is living proof that grappling has a dominant place in real fights. However we should be very careful about that statement. You do not want to go to ground and grapple on the street because if any of your opponent’s friends are around they can come and kick you in the head and only God knows what they will do to you once you are unconscious. Fight your fight standing and use your grappling abilities to stay on your feet or for getting back up if you happen to find yourself on the ground. 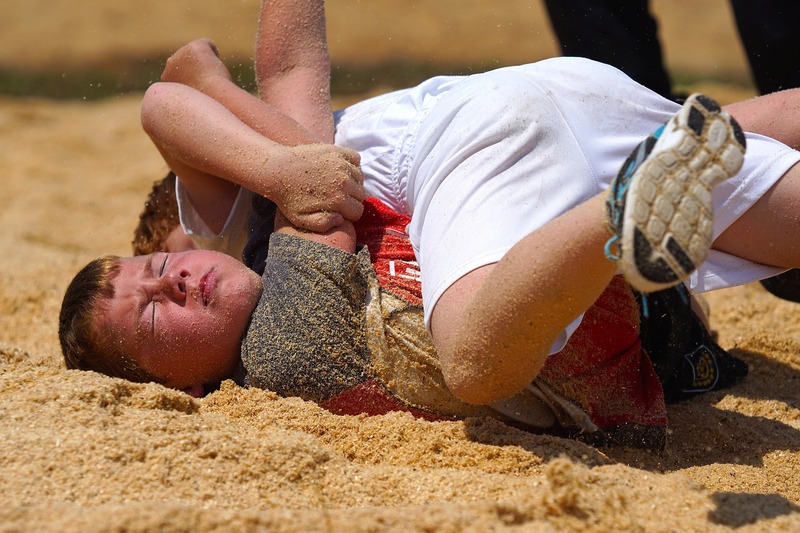 If you are young and you are getting into martial arts for the long haul start with grappling. I always say: “Striking Arts are like carpentry, in 6 months you are good to go! Grappling Arts are like Genetic Engineering, the possibilities are endless”. If you consider the UFC again you will see that the likes of Ronda Rousey (judo), TJ Dillashaw (wrestling), Jon Jones (wrestling), and Cain Velasquez (wrestling) -all of whom were champions in their respective weight classes- have not been strikers for a long time but it did not take them long to learn boxing and muay thai techniques which they incorporate into their arsenal so well; even knocking out opponents using these striking techniques. It takes a lot more time to figure out the grappling techniques enough to be able to submit or choke your opponent if you are a striker who is now learning the art of grappling. The best you can do is use your knowledge of grappling to defend against takedowns, submissions, and chokes. Most of the best UFC fighters with a striking background utilize their grappling in this way and it works quite well for them. My favourite would be former light weight champion Chuck Liddell (Predominantly Kickboxing) who had some great wrestling defence which he used to stand up as soon as he was taken down. How about Junior dos Santos (Boxer) who had been taken down only once before his fight against Cain Velasquez? I can’t think of any better examples of strikers using grappling to be better fighters and yet they have never submitted anyone of significance or chocked them out. So if you are young and you have your whole life ahead of you, you should start with the part that takes the longest to learn but will make you extremely dominant. Once you are great at grappling you can take up striking. Here is a great resource to get you started while you search for a club: Click Here! If you are one of those guys who has been in confrontations in your neighbourhood not because you are a trouble-maker but because trouble is always breathing down your neck start with striking. Not all of us come from the same background and in some places you just have to stand up for yourself. Remember that fighting is not cool and no amount of martial arts will make you invincible. That being said you have to be able to strike fast and run for it when you have to. Sometimes you might have to defend a loved one and you are not going to do that by pulling guard on someone. You hit them and you hit them hard and fast and that is exactly what striking martial arts will teach you. For very young kids who want to start martial arts, I say to the parents that grappling would be the answer as they are not in immediate need to beat up people and it is a safer way of introducing them to martial arts. However if your kid loves punching and kicking then send them to a Shotokan Karate dojo. It is a point fighting system which will help them with coordination, speed, timing, and striking accuracy under a very controlled environment. There are similar forms of karate if you do not have Shotokan near you. Shorin Ryu and Goju Ryu are other examples of karate point fighting systems. If you are old enough (10 years onwards) I highly recommend boxing. It will make you a devastating fighter in the ring if you decide to take your martial arts further and a dangerous opponent in the streets. In fact boxers make great muay thai practitioners when they make the switch. Starting with muay thai or kickboxing is also not a bad idea, especially if you want to learn how to quickly strike and injure your opponent in self-defence. If your teenage years have come and gone and have never practiced martial arts of any sort I would suggest you jump straight into mixed martial arts (MMA). Believe me when I say you will save time and money if you choose to join an MMA club instead of going to different dojos every week to learn two or three different martial arts. Another advantage you will have is that you will learn how to efficiently transition from grappling to striking and vice versa during a fight. You need to be in an MMA training environment to be able to do that. You should however make sure that the MMA club is a good one. A lot of people these days start up MMA clubs. 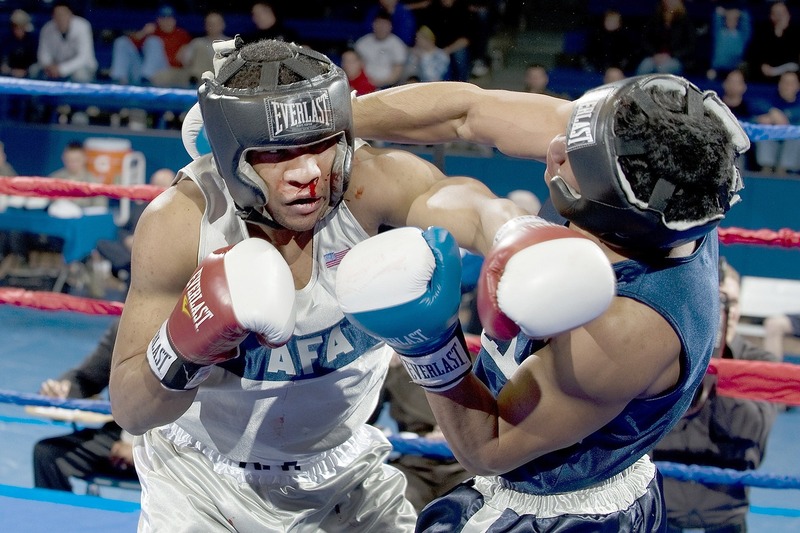 Someone who has a boxing or wrestling background may open up an MMA club and as soon as you start training there you might notice an emphasis on the style he is comfortable with. There should be a separate trainer and training day for the different disciplines that make up MMA. If that is not the case please do not waste your time and money and find another alternative. Self-defence classes (Krav Maga, Kajukenbo, Traditional Jiujutsu etc.) are great in teaching you awareness when there is trouble. They are also great for knowing how to control the situation by positioning yourself and your loved ones properly. You may also find yourself in a situation where you cannot use your striking and cannot use take down techniques and so on. In such close combat moments self-defence classes may save your life. If you are a woman or a small person you will have people trying to put you in such a predicament. The reason why I mention self-defence is because everyone starts training martial arts for a different reason and when it comes to mixed martial arts (MMA), self-defence is the original MMA even though today when we speak of MMA we only think of cage fighting. Here is something you need to see, but only if you are considering self-defence seriously: Click Here! So there you have it; the answer to the eternal question of “Grappling vs. Striking”. Listen to your needs, cater to your personality and do not follow what others do just for the sake of it. You know yourself better. One more thing; please I beg you not to be part of the great debate that is “Grappling vs. Striking – which one is better”. Are you planning to start martial arts soon, planning to switch styles or just think this post is AWESOME? Please comment below. Thank You! ← 9 Insane Facts About Your Food That Will Give You The Ultimate Shock! At age 70 my favorite thing is to box. Couldn’t say it better!!!!! Russian Sambo!!! Thank you for your wonderful comment. I hope to be staying fit at 80 as you are! If you lived in my area, I would have you boxing for free. I have taught basic moves to 14 ladies between 50 and 90. I love it. would you like to make instructional blogs or vlogs for us then. Is they voluntary, or an assignment. I just think this post is awesome. I believe that is very good advice. I didn’t think of it that way. This time around I would suggest someone new to contemplate BJJ as their first art, and to supplement in dojo training with the online Gracie University training. They have a refreshing take on white to blue belt that a lot of people would enjoy. One of the hard parts about doing BJJ is the very competitive nature of rolling with other students, and your performance dictating your advancement. Gracie University uses white to blue belt as a time to learn most of the actual self-defense moves that also incorporate the live rolling. There are videos on YouTube, check them out! I think the problem with BJJ belt-rankng is that there is no universal standard. The trainer decides when someone advances to the next level. There should be some sort of judge panel that examines students and decides along with the recommendations of the trainer. I have a question that has recently been a bit of a debate. I’m 21 years old and my husband has trained in 5 martial arts along with basic street fighting and grappling (he worked as a bouncer for years). Now, keep in mind in 5’5″ 110lbs and virtually no muscle mass, but I’m also rather agile and flexible and have a fairly low center of gravity. I’ve always been a natural at grappling to the extent of being able to get away (3 brothers) however my grappling is only *almost* useful if that makes any sense. I think it would be best to improve my grappling to a useful point before worrying about a focus on striking (especially since my balance isn’t the greatest) but a few people have been saying I should learn striking first. I was just wondering what your opinion is. Every fight I’ve been in has ended up on the ground and my grappling has always (by luck) given me the upper hand or an escape route. I would just take some time to learn some actual techniques so I can use it as a fall back while I learn martial arts if that makes any sense. Other info: my husband is 5’6″ and 220lbs and he’s my primary teacher and grappling partner. We live in a very rural area and I’m not out alone often so self defense in general isn’t currently as much of a priority (well armed at home). Good question Daniela. I always say to people to stick to what they know best because in a real fight you don’t want to be experimenting with new techniques. Having said that, striking is a natural thing and its how fights usually start. So you do need some striking; just enough to be able to defend yourself. It’s easier for a grappler to transition into striking than the other way around. My advice is, stick to what you are doing and improve on it but squeeze in some time for striking maybe twice a week. If your grappling is good enough to win you three fights, complete your arsenal with striking so it can do the same for you. In a nutshell: do some basic striking to help you in a fight, perfect your grappling to reach the level you desire. This is an interesting feed of conversation. As it has been said, it depends on what and why you need this. This sounds very sport oriented though. I to, am a practitioner of a MMA self defense program, with a foundation in Choi Kwon Do. Our founders work with the military and law enforcement as well. There is no one size fits all method, because application and scenarios are different. Both skills are necessary and a good ground defense should be for a ‘something went wrong’ scenario. The number one requirement should be reverse the urgency, which makes it striking. A huge difference between cage, sport and street are the rules. There are none when dealing with a self defense situation. You can and should go for the eyes, throat and groin of you or your loved one’s attacker. You cannot let ego get in the way when you have the knowledge and skill, to injure or kill. Well said, I agree that a fight on the ground should happen only when something goes wrong. All fights start standing and should end their. It’s much safer. The more aggression the better. For me like many others it depends what your primary style would be, I am a striker first and foremost and play to my strengths , I have a limited amount of decent ground skill but understand the mechanics of locks and leverage so use that to try and better my position so I can strike. I think the main short comings with most of us is that we have an ego that wants to prove we can beat anybody at anything even if that is not your style or strength , We see this with many pro ufc fights – guy is a amazing wrestler or jits guy wants to stand and bang , the striker who is an ex this and that champ decides that he now knows enough jits aand wrestling in his 6 week camp that he can now hang with the best of them , i understand evolving but stick to your strengths and work on your short comings . Jack of all trades ………..
“I think the main short comings with most of us is that we have an ego that wants to prove we can beat anybody at anything even if that is not your style or strength , ” <— this is absolutely true! Martial arts aren’t always about combat, sure, by the dictionary definition they are bit people train for many different reasons and self defence is only one of those. I consider myself a sportsman more than anything else. That being said, MMA is also a sport. Sure it can be used to great effect for self defence purposes, as can karate, judo and pretty much all martial arts (I have doubts about aikido). Grappling certainly has it’s place and a fighter who can’t grapple will certainly have problems when fighting against an opponent who has grappling skills as well as striking skills. Unless of course the one with grappling skills is knocked clean out before entering grappling range. Yet I’ve never seen a pair of strikers remain at striking distance for an entire bout. 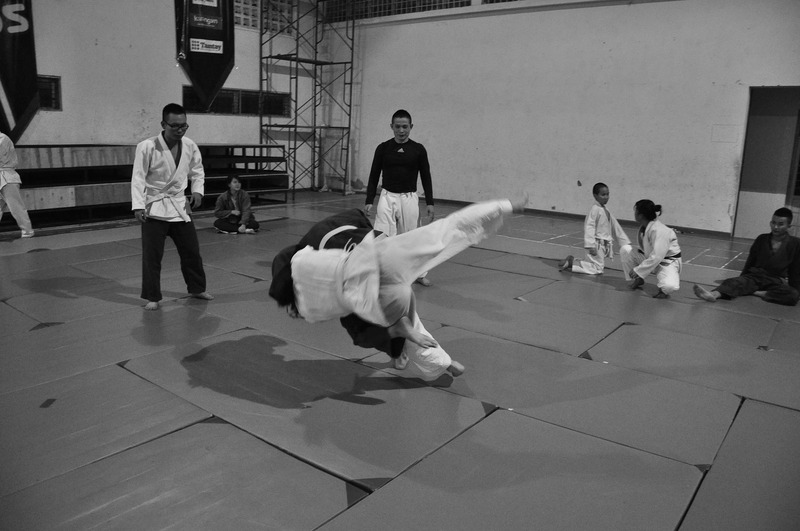 Be it boxing, kickboxing (any variation thereof) or a TMA such as karate or taekwondo, the participants almost inevitably enter grappling range at some point. As you said, Alwi, in a real fight staying on your feet is of paramount importance yet knowledge of grappling and takedowns is also important to help avoid being taken down. I’m my personal opinion, coming from nearly 19 years in martial arts, 6 years in the armed forces and 8 years as a nightclub bouncer, I believe if you can’t punch, you can’t fight, most fights start at punching range and a well placed left or right can end a confrontation in one go. However, my training in judo/ju Jitsu has been invaluable as has the small amount of tai chi I trained in, limiting oneself to only one range will always provide a weakness for the opponent to exploit. If one wants to be a truly effective fighter, then one needs a knowledge of all aspects of martial arts. In my mind martial arts (for fighters) is kind of like a tree, with punching being the main trunk or core with kicking and grappling being branches that shoot out from either side. Ignore one element though and you don’t have a complete tree. Thanks! Great answers from all you guys, especially how you answer from own experience. i will say it depends on situation. for me i train mostly striking arts n will keep my opponent out of range or knock him out the moment he gets in but the moment i got taken down or fell down i immediately roll back up. so rarely theres a chance someone can keep me on the ground but i havent fought with experts grappler full contact so i wont take the chance so i went to a grappling school n focus primarily on how to escapes from lock n submission and how to get out and up fast, so u can say i focus mostly on defence and counter when it comes to ground game as i believe ground game takes long time n im more of a striker. To me Martial Arts is a personal journey. Regradlless if you start with a Striking MA or Grappling, in the end it needs to be what works for you as an individual. The question most laymen will ask is usually “Can a Grappler beat a striker?” and vice versa. My answer is it depends on the individual. Can a grappler get a striker to the ground? Yes he can, but don’t be complacent. There are fighters out there that will make you pay for coming into their striking range and it will hurt… ALOT!!! Once on the ground however, the grappler is at home and after that the fight is over. On the street? Going to the ground is rarely a good idea, because as your article stated, if your opponent has friends, you are going to be in a world of trouble. In short, a Striker has to learn how to deal with a grappler. Learn enough that he can at least buy enough time for escape or make the job harder for the grappler to get the choke/arm bar/ankle lock/whatever. Grapplers would be wise to learn how to close the range with a Striker without copping an absolute pummeling in the process. IF you look at the rules for UFC and Cage comps they are very bias to Grappling as UFC was the Gracie’s “child” anyway. It opened the eyes of many Strikers that Striking alone won’t do. BUT it also opened the eyes to Grapplers that Grappling alone won’t do either. It shows that a successful fighter has to be effecting on ALL aspects of fighting. MMA is successful because of this. Thanks for checking out my blog! Check out http://www.thelifestyleguru.com for my complete line of health and wellness products. They’re great for those who participate in any type of athletic activity!